Our Quote of the Week celebrates Special Olympics, an organization that was near and dear to Sargent Shriver's heart and that has been in the news frequently in the past several days. Sarge's words remind us of the power of Special Olympics to unify all people regardless of their origins or abilities. Last week, the overwhelming response to the Department of Education's plan to cut public funding for Special Olympics from the 2020 budget revealed, in a heartening way, the priority that many of us place on building a more inclusive society. People from all walks of life and political affiliations spoke up in support of Special Olympics, leading to the President's reversal of the proposed cuts. Although the organization secures private funding for its athletic programs and competitions in its 172 member countries, its public funds are used in the creation of Special Olympics Unified Champion Schools® a program aimed at building school communities that empower all individuals, regardless of their intellectual or physical ability, to participate together in all activities of the school. Unified Schools deepen what is an already-global effort on Special Olympics' part to create an "inclusion revolution." Some background on Sarge's connection to Special Olympics: The organization was founded by Eunice Kennedy Shriver, Sargent Shriver's wife. Sarge watched the organization grow and thrive throughout the 1960s and 70s and was a frequent participant in activities related to the organization. Between 1984 and 2003, Sarge held several official roles within Special Olympics, including President and Chair of the Board. Sarge's values and experience were a natural fit for the organization: his staunch belief that all people should have the opportunity to thrive on their own terms, and his ability to forge bonds that transcend borders, brought together the principles on which he had built the Peace Corps and the War on Poverty. Sargent Shriver became a global messenger for Special Olympics' message of inclusion and unity, expanding the organization throughout Eastern Europe, the Asia-Pacific, and North Africa. Today, Eunice and Sarge's son and current Chair Tim Shriver, along with an army of Sargent Shriver International Global Messengers, continue this important work. 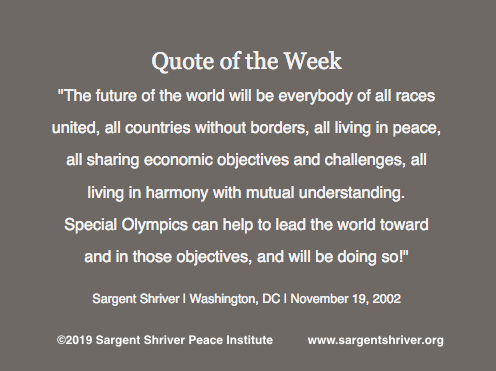 In 2002, when Sargent Shriver spoke the words in our Quote of the Week, he stated that Special Olympics "can" help the world to unify people, bringing about peace and understanding, and that it "will" do so. In 2019, Special Olympics is helping to bring about a more unified world, and, in the words of Tim Shriver: "We're just getting started."